Located on the prettier Left Bank of the city, L’Hotel’s entrance is so discreet that you could easily miss it. 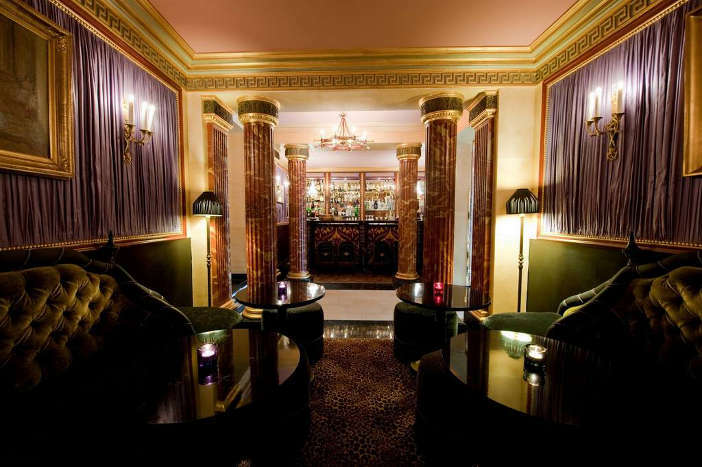 Once inside, you step back to bohemian nineteenth century Paris, and guests unaware that it was once the final haunt of Oscar Wilde (post trial) would hardly bat an eyelid – it simply oozes Parisian chic, from plush velvet smoking chairs in the bar and sumptuous curtains concealing the bright yet cosy dining room, to the decadent cuisine guests can prevail of when inside ‘Le Restaurant‘. If you like your living space minimalist, L’Hotel will either convert you to dark drapes and an abundance of cushions or have you running to a nearby Swedish home store. For myself, I couldn’t think of a better way to begin a visit to the city and, sinking into the womb-like armchairs, I basked in the flattering glow of candlelight, even as the sun shone bright outside. When you do venture out, you’ll find the surrounding streets awash with fine boutiques specialising in French antiquities, gilded object d’art and other treasures which no doubt draw collectors from around the world. It certainly makes for highly entertaining window-shopping in between pausing in side street cafés for an afternoon espresso or a macaron on Ladurée’s Rue Bonaparte shop and some much needed sugar en route to the sublime Musee D’Orsay, where one can gaze at yet more priceless art. 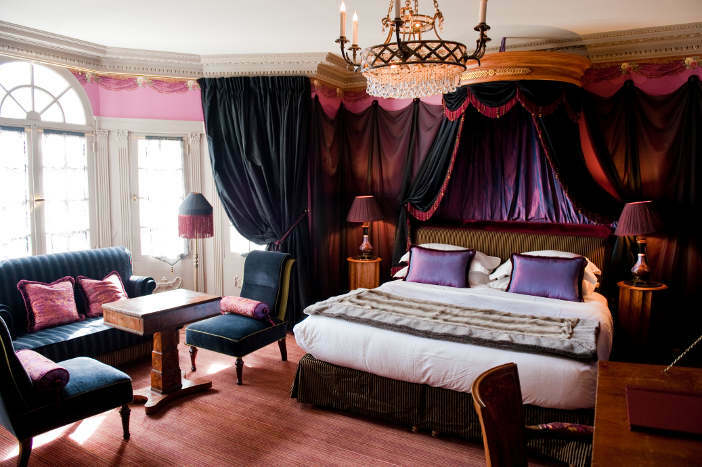 We were in search of romance not ghosts, however, and the walls of our ‘Chic’ room fitted the bill perfectly; the walls draped in luxurious fabric, a crystal chandelier suspended from the ceiling and a regal-looking gilded canopy bed in which to repose at leisure. Rooms are reached via a ridiculously small elevator or the impressive spiral staircase. In 2011 Oscar Wilde’s tomb in the Père Lachaise Cemetery (the largest in Paris) was cleaned of lipstick marks and was surrounded by a clear screen in the attempt to protect it from adoring fans. Since the 1990s and just one lipstick mark, the tomb quickly became a landmark on the city’s tourist scene and where pilgrims would write graffiti containing expressions of love, such as: “Wilde child we remember you” and “keep looking at the stars”. It’s worth a visit. Paris continues to be justly regarded as the ‘City of Love’ and never better illustrated than the Pont Des Arts bridge (just a few minutes’ walk from L’Hotel), world famous for being covered by padlocks or ‘lovelocks’ left by lovers as a symbol of their devotion to one another. Having suffered partial collapse earlier this year as a result of an estimated 700,000 locks being attached to it, many have called for the local authorities to ban this rather odd custom. However, the city has so far refused to enforce this measure and simply suggests lovers display their affection by taking a photograph on the bridge – unlikely when you consider how many of the city’s unfortunates make a living from selling locks near the bridge. On chancing to be in Paris at the same time as my fiancé’s parents, we decided to mark the occasion with a private 90 minute Seine Avenue champagne river cruise. With the port happening to be just a 10 minute walk from the hotel, the journey offered the four of us a chance to admire and photograph some of the city’s landmarks from a new perspective. 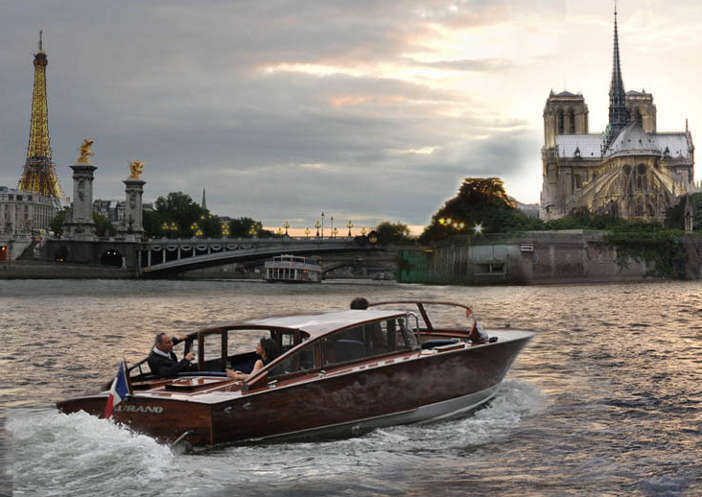 Seine Avenue’s proprietor, Philippe Fournié, painstakingly restored the vintage Venetian water-taxi ‘Murano’ over a period of many years; crafted from mahogany with glistening chrome fittings, the central cabin of the boat is fitted with two long banquettes upholstered in blue leather and there is an open seating area to the rear of the boat which makes the perfect position from which to view the passing sights on a warm and sunny day whilst sipping Moët & Chandon. You’re guaranteed the best possible view of the Eiffel Tower and it also happens to be an extremely relaxing way of seeing most of the major icons of Paris within a relatively short period of time – ideal if you only have the weekend or it’s your first visit. Returning to the hotel in plenty of time to unwind before the best dinner we experienced in Paris at L’Hotel’s Michelin-star dining room, my chap and I reserved the hammam pool and steam room for an hour (complimentary for guests) and which staff prepare ahead of your arrival with candles, towels and toiletries. I have a feeling that the man who said: ” I am always satisfied with the best” would have liked L’Hotel and, if you believe in such a thing as spirits (other than the alcoholic kind) perhaps he never checked out. L’Hotel, 13 Rue Des Beaux-Arts, Paris, 75006, France. Tel: +33 1 44 41 99 00. Website.